This recipe comes from Joan Ohm, mother of Laura Ohm, Grand Central Bakery's pastry commissary and kitchen manager. During the first or second week of summer vacation, Laura's mom used to get her out of bed "way too early." They would go to the U-pick strawberry fields where Laura would, predictably, eat more than she picked. Lucky for Laura, her industrious and efficient mother would get them out of the fields and headed home with a few flats of berries in no time. This is the pie she always made when they got there. 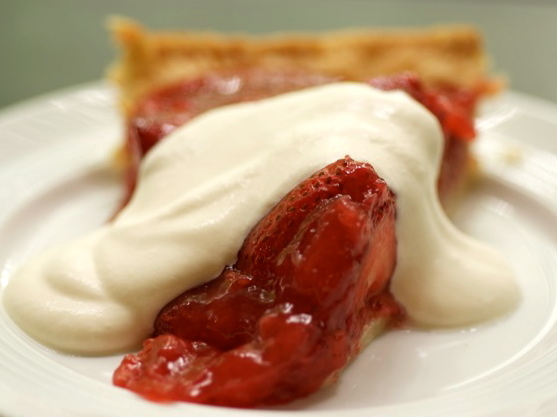 I've never known Laura to use the Cool Whip called for in the original recipe to finish this pie, but I do know it's the recipe that comes to mind when she glimpses the first strawberries of the season. Prepare the filling: Combine 1½ pints strawberries with sugar in a medium saucepan over medium-low heat. Make a slurry with the cornstarch and lemon juice, and add it to the berries. Cook, stirring constantly, until sugar dissolves and mixture comes to a simmer. Reduce heat and mash berries with the back of a large spoon as they continue to simmer. When the mixture is thick and glossy, after about 3 minutes, remove from heat. Fill the pie shell: Arrange remaining hulled, uncooked strawberries decoratively in pie shell. Pour filling over berries and allow it to set, at least two hours. Serve with lightly sweetened whipped cream. If you live in the Pacific Northwest, try one of Grand Central Bakery's premade pie crusts; they're much better than the typical supermarket pie crust.